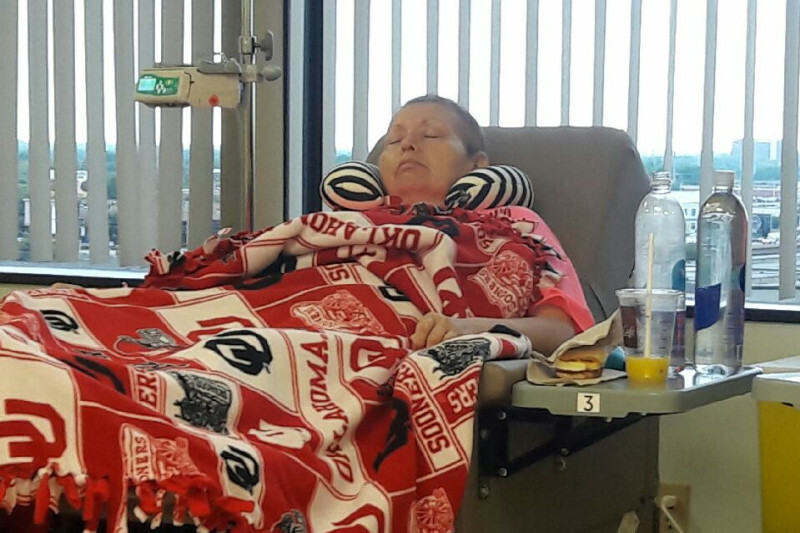 This GoFundMe page is an effort to help Danny and Betty Roberson raise the much needed funds for Betty's cancer treament. If you know them you know that they've been battling this cancer for several years, and things have taken a serious turn for the worse in the last month. Danny has been fighting the insurance company to get coverage for a treatment that can have some very powerful positive effects but has so far been turned down, three times. This is a time sensitive situation. He has exhausted all avenues with the insurance company and is now looking for any other possible ways to provide Betty with this treatment. Below is more detailed information of the situation that Danny sent to me. ANYHTHING, in any amount, that you can provide would be a great help! "My wife Betty and I have been fighting a cervical cancer battle for just over two years now. She has had countless rounds of chemo and all of the photon radiation that her body can handle. In that time we have managed to shrink the tumor from softball size to golf ball size with no metastasis. However, for the past two months she has had pain that is unbearable. Pain that brings her to tears. We found out the cancer has just begun to invade the hip bone causing extreme pressure on the sciatica nerve. Proton beam radiation was recommended as an only option. It will target only the affected area and not affect the areas that cannot handle more conventional radiation. It could halt the progression of the cancer, and would certainly relive the horrible pain it is causing. This type of radiation could mean the difference between Betty living several more pain free years, or only having a few very painful months left. We have seen a pain management doctor and are having to keep her so doped up in order for her to stand the pain that she has very little quality of life. Our health care provider has declined coverage for the proton beam therapy stating it is only covered for children or brain cancer. There some circumstances, such as with my wife, that it is the only option, but insurance will not cover it. We have exhausted the appeals process and were declined each time. No human should have to suffer like this, and no human should have the power to decide if a person could live a few more pain free years or only have a few more months left racked in pain with no quality of life. Betty is not only my wife, but she is my best friend and my soul mate. I will stop at nothing to get this done for her. The cost of the treatment is $55,000. I asked the hospital about a payment plan and they said I could pay half down ($27,500.) with two monthly payments of $13,750.00. Quite a joke of a payment plan. Any help, in any amount, could get us to our goal and we, as well as you, would be very blessed for it. Thank you all so much. Channel 5 news has graciously shared Danny and Betty's story and the the current status of their struggle. If would like to read about it or watch the story posted, you can follow the link below. Thank you again to all those who have donated, shared, and prayed for the family during this difficult time. Danny has asked to let all of you know that he is truly grateful and thanks all of you for your donations. Betty recently had to have another surgery so he has been out of work to be with her, and when I hear more on her current status I will update all of you again. Thank you for supporting Danny and Betty and please continue to share this page and link. Hi Betty and Danny. Just want to share with you info that might help your situation. I have a client that was diagnosed with the beginning stage of breast cancer. She called Cancer Centers of America and it is free and she is doing great. She said there are people there that were sicker and they were helping them as well. Doesn't hurt to contact them and see what happens..www.cancercenters.com. Hope this helps. In my prayers! Will be praying for you to get well. Betty hang in there ... your prayer will soon be answered by the LORD. Just hang in a little bit more.